...because EVERYONE loves a photo booth! They're fun, entertaining and they will provide hilarious content for you and your guests to enjoy. It's a welcome addition to any party. My Photo Booth (pictured here) is a sleek, modern open-air concept, which means your guests will not have to pack into a tight, enclosed structure. Instead, people stand in a 10' x 10' x 10' space with the booth in front and an optional background behind them. The booth itself features a Microsoft tablet that will allow you not only to see yourselves as the camera snaps away, but you'll have the ability to share immediately content via SMS, email, facebook AND twitter! You'll even have the ability to print on-site! Pricing information is below. If you have any questions, please contact me! - Lots of cool props! + UNLIMITED printing for everyone! • How does your Photo Booth work? The booth is controlled entirely by the touchscreen. My Booth assistant will introduce himself and give a bit of advice on where to stand. Your guests will be able to see themselves as the screen counts down, allowing them to strike a pose. After a three second countdown, the flash will go and the photo is taken. If you have selected a multi-photo template, the process will start again until all images have been captured. At the end of the session, your selected template will be presented on the screen and your guests are then free to print and share! • What is the booth capacity? Well the fun answer would be as many as you can fit! It’s an open-air concept so people will not have to pile into an enclosed space. The minimum area required for the booth is 10 x 10 x 10 feet, however, if you are able to allocate more space, then we can certainly plan accordingly. We can discuss the exact placement of the Photo Booth during our venue walkthrough. Active booth time is the actual time you want the booth operating and available to your guests. For each event, we arrive 60 minutes prior to the start of the event to set up and we will stay, of course, to tear down. This additional time is accounted for within my pricing. • What kind of prints do you offer? You will have the option between 4 x 6 or 2 x 6 prints. ‘Unlimited’ means that everyone is free to print so that no one goes home empty-handed. 'One print per session' means that only one photo can be printed from each session and that photo is meant to be placed inside the guestbook. • What kind of printer do you use? It is a DNP DS620 dye-sublimation printer. It’s fast, efficient and produces amazing quality prints in seconds. • What are the power requirements? A standard 110 - 120 Volt AC adaptor three-prong outlet. Everything is connected inside the unit, so the only thing that is needed is the wall outlet, which would ideally be 10 - 15 feet from where the booth is placed. • How does social media sharing work? 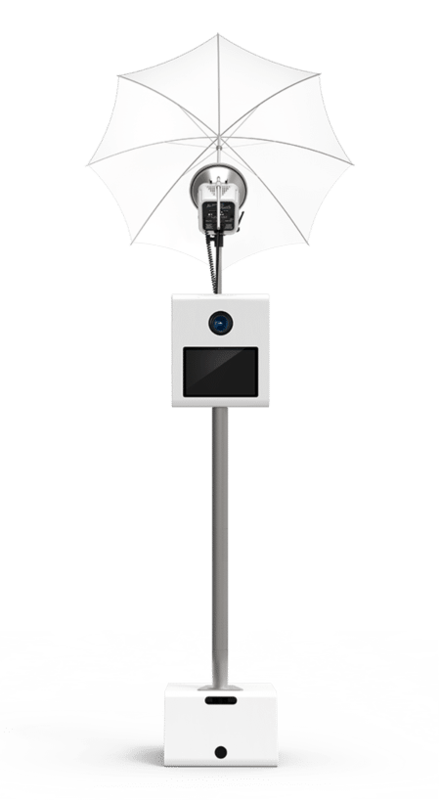 My booth will allow your guests to share images via SMS, Email, Pinterest and Facebook. Everything can be done from the booth screen itself as soon as the photos have been captured, as long as there is a good WI-FI connection. Bear in mind that Instagram does not allow instant sharing, but your guests can get around this by simply sending the images themselves via SMS and post from there. • How long does it take to set-up the booth? To physically set up the booth, it takes between 30 and 45 minutes depending on what you would like included. The booth is set up by my assistant and the time for set-up is built into the overall cost. My assistant will always arrive 90 minutes before the start to be sure everything is working properly. • Can the booth be used outdoors? Indoor is always preferable, but as long as it is a flat surface, a nearby power source and no direct sunlight, the booth can be placed outdoors. In case there is wind, I have enough sandbags to keep everything secure. • How much space will I need? A 10’ x 10’ x 10’ area is ideal, but if you would like to have a guestbook production area, you should consider that as well. We will go over this during our venue walkthrough. • Is the booth kid friendly? • Do we need to provide Wi-Fi? If you would like the ability to share your images by SMS, email or social media, then WI-FI should be provided. If that is not possible, the Booth will queue up the images and send them out as soon as the system is re-connected to Wi-Fi, just after your event. If you know in advance that Wi-Fi will be unavailable or spotty, we can provide hotspot capability for a small additional cost. • Can we use or create our own backdrops? Definitely! I have a selection of very nice backdrops as part of my standard packages, but if you want to create your own backdrop, then let’s make it happen! Remember, a backdrop isn’t always necessarily a requirement. If your venue has a cool wall or built in feature, that could work as well! • Can your booth shoot black and white images? Yes, you will have the option to select black and white or color when printing and sending. I can also provide black and white in addition to color images if you would like for the final delivery, just let me know. • When will the digital files become available? All images taken are stored in an active DropBox folder inside the tablet, so I will simply send a link to your images at the end of the evening. In addition, I will create a password-protected online gallery so that you and your guests can have additional access. Yes. I can provide a COI if your venue requires it.